It is my honor to take over the Directorship from the former Director and the current President of Kagawa University, Dr. Yoshiyuki Kakehi. After a quarter of a century has passed, and various aspects of rare sugar studies initiated by Kagawa University have brought much academic knowledge as well as opened ways to utilize rare sugars for industry. Consequently, rare sugars have received great attention domestically and internationally. 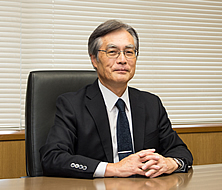 In April 2016, the International Institute of Rare Sugar Research and Education was established under the leadership of Professor emeritus Dr. Ken Izumori (Research Adviser of the Institute) on accumulated bases of basic and applied research as an international foundation for rare sugar research education by unifying the research capabilities within Kagawa University with close cooperation and support from various academic institutes, governing bodies, and specialized companies. One and half year after its establishment, an active system has been developed and the achievements have been steadily increasing. We welcomed Professor emeritus of Oxford University G.W.J. Fleet, as a Visiting Professor, as well as three Assistant Professors arrived for expansion of research system in the Division of Rare Sugar Production. In November 2016, the Sixth International Rare Sugar Congress was successfully held in Kagawa for research exchange and cutting edge discussions with more than 200 researchers from many countries. There were over 350 attendees for the "Rare Sugar Seminars for Public" hosted by our institute and the exhibition by rare sugar-related companies. The "Introduction of Rare Sugar Studies" was on display for a month and a half, beginning in January of 2017 at the entrance of Ministry of Education, Culture, Sports, Science and Technology Japan in Tokyo. Our achievements were successfully exhibited to Ministry officials and visitors from across the country. In August 2017, Regional Innovation Ecosystem Formation Program was granted by the Ministry of Education, Culture, Sports, Science and Technology. This large project aims to promote industrial use of rare sugars as natural sweetener or medicinal foods by utilizing research achievements owned by our University to create new markets. In April 2018, the Graduate School of Agriculture of Kagawa University will be reorganized, and a new "Division of Applied Biological and Rare Sugar Sciences" and academic course specified by rare sugar education will be started. With the reorganized special framework for rare sugar studies in the doctoral course of the Graduate School of Medicine of Kagawa University in 2016, these Graduate Schools will play the core role in rare sugar education. Our institute will support these educational programs for training specialized human resources and also will push forward research and development to be innovative and the world-class research center. I expect and look forward to full hearted support for the International Institute of Rare Sugar Research and Education.